To avoid accidents, please assemble the wheel set properly before use. The pregnant, old or patient with joint problem are prohibited to this set of exercise wheels. Please stop using this product when you feel discomfort. The material of cushion is EVA. AB wheels are a set of fitness exercise wheels light-weighted, portable and durable, you can use it anytime both at home and in the gym. Made of high quality material, molded comfortable grips for a secure grip. 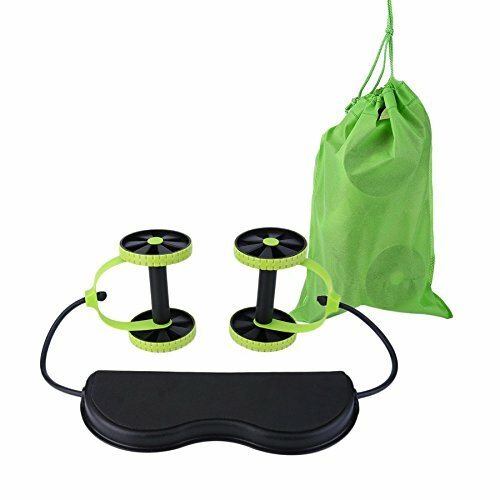 It is really great to do fitness exercise with this set of exercise wheel to trim & tone your waistline or strengthen arms, shoulders, abs, chest and back, etc. The rope can be adjustable from 35 cm to 95 cm. Rubber pads under the cushion to prevent slipping and protect your floors.